Today, I stepped out of the door and it looked kind of funny outside. It was bright, but there was no direct light, almost like it looks right before the sun rises. Only this was 8:50, so it was definitely not sunrise lighting. Then I heard the rumble of distant thunder. I went back inside but quickly remembered that I had left my trenchcoat at work earlier in the week. I'd just have to walk quickly. It takes me 20 minutes to walk from my front door to my office. Well, technically my back door. My front door is impassable due to the bikes and pile of coats that seem to be a permanent fixture there. I set out and at about one-quarter of the way, felt my first sprinkle. Awesome. It was at that moment that I realized the inappropriateness of my attire. Pants (for the first time in probably 2 months), a white t-shirt, and, um, colored undergarments. ** Even more awesome. But it was just sprinkles. I upped my pace, half hoping that one of the cars driving by would realize my plight and offer to drop me off at the bottom of the hill. Alas. Half-way, it started to get a little heavier. I would walk five paces, then do a little jog/leap for a couple mor epaces, then walk again. Started seeing lightening. Did my elementary-school best to estimate the distance of the storm, trying to remember how quickly storms move, and how much further it was to my office. I arrived at an intersection at the 3/4 mark right as the pedestrian light changed to "Don't walk." I jay-walk across this street regularly, but today I was going to do it with purpose. I looked at the line of cars. Cop car at the end. "Sorry, Mr. Policeman, but I'm going to have to cross this street." Seriously powerwalked the rest of the way to the office. Got inside, and by the time I got into my 8th floor office and got a drink, it was pouring. Sheets and sheets. I am a lucky, lucky girl. And I have resolved to keep a change of clothes at the office. *As a final note, in the time it has taken me to write this story, the rain has completely stopped. Sigh. **I didn't even know it was possible to wear colored garments under white t-shirts without being obscene until I received some that didn't come from Wal-Mart or Target, and that actually cost more than $5. Being as I have a fair amount of time this week to pursue crafty endeavors, I decided that it was time to post some more on this here blog. I need to get organized a little for the rest of the week, so today's post is a short one. I'm not a huge jewelry wearer. I tend to put in a pair of studs and wear them for a couple weeks. Part of that was the fact that all my jewelry was in a little 3-drawered mini bureau, kind of tangled up. And, as the saying goes, out of sight, out of mind. 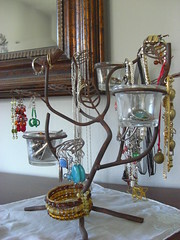 So I'd like to share my jewelry tree. It's just a candle holder that I got at Big Lots. The branches hold necklaces, the leaves (and little bird) hold dangly earrings, and the actual votive holders hold necklace charms and pins. And they all sit atop my grandmother's handkerchief, which is lovely (and keeps the tree from scratching my dresser! ).